Dr. Hollis knew she wanted to be a veterinarian when she was in kindergarten. She insisted on going with her father when he was taking their dog to the vet. She knew right then that she wanted to be a veterinarian. She couldn’t think of a better job than helping sick pets. 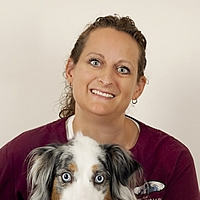 She gets to live her childhood dream everyday as an Associate Veterinarian at Franksville Veterinary Clinic. Dr. Hollis grew up and lived in Lake Elmo, MN with her parents and two sisters. Some of her hobbies then were horseback riding and showing dogs. Dr. Hollis earned her Bachelor’s Degree at the University of Wisconsin – River Falls. She then went to the University of Minnesota, College of Veterinary Medicine where she earned her Doctor of Veterinary Medicine Degree. Dr. Hollis says that there is no better feeling in the world than knowing she helped save someone’s best friend. She strives to do the best she can every day for her patients and clients. Deb is married and they have two daughters at home. They share their home with three dogs, Sage, Spirit and Apache. They also have three cats, Schmutz, Squishy Pickle and Eclipse, horses and rabbits. In her spare time she enjoys spending time with her family and taking care of the family farm.